Just when you think Atlanta couldn't possibly sustain another burger place, another one crops up. 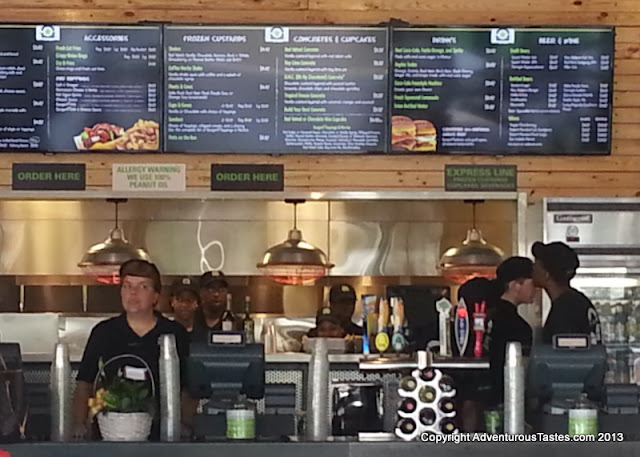 This time in the form of BurgerFi, a franchised chain out of Florida. Usually the word chain is an immediate turn-off to me, but when I hear things like "all-natural, grass-fed beef" and "environmentally sustainable" stores, my ears perk up. 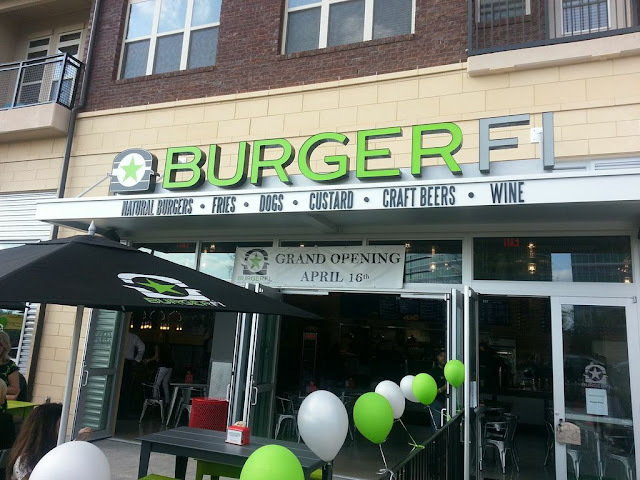 You see, BurgerFi isn't your run-of-the-mill burger joint. Not only is it more eco-friendly and humane, but it offers plenty of ways to snazz up your meal. In the pantheon of Atlanta burger joints, it's most similar to Yeah Burger but with lower prices (The BurgerFi cheeseburger is $5.97 vs. $8.49 for a comparable Yeah Burger). BurgerFi isn't just burgers either. They also boast a fairly wide variety of hot dogs and shakes/concretes with plenty of ways to dress them up, too. Burgers range from traditional (BurgerFi® Cheeseburger - Double Natural Angus burger, double American cheese, lettuce, tomato, and BurgerFi® sauce) to haute (Brisket Burger - Double natural 28 day dry aged ground brisket, Swiss cheese, blue cheese, lettuce, tomato, pickles and BurgerFi® sauce) to the downright decadent (B.A.D. (Breakfast All Day) Burger - Natural Angus burger, American cheese, hickory bacon drizzled with maple syrup, fried egg, hash browns, grilled diced onions, and ketchup). There are vegetarian and no-bread options as well as plenty of toppings you can add-on as well. with grilled mushrooms, hickory bacon, and American cheese. This burger was stacked so high I couldn't actually take a bite of the whole thing without making a mess, but that's what napkins were invented for, right? The burger was juicy and delicious, and for me a single patty would have made for a satisfying meal. The Mr. went for the Brisket Burger, which to be honest didn't taste that different than my regular beef burger. That being said, it was also quite good, and blue cheese always makes for a compelling burger in my book. We also ordered the onion rings and the Urban Fries from the secret menu, which are topped in parmesan and and herbs and served with a garlic aioli. Both were nice and crispy and the portions were huge. I definitely recommend getting the garlic aioli with the fries as they take the already delicious parmesan and herb topping up a notch. 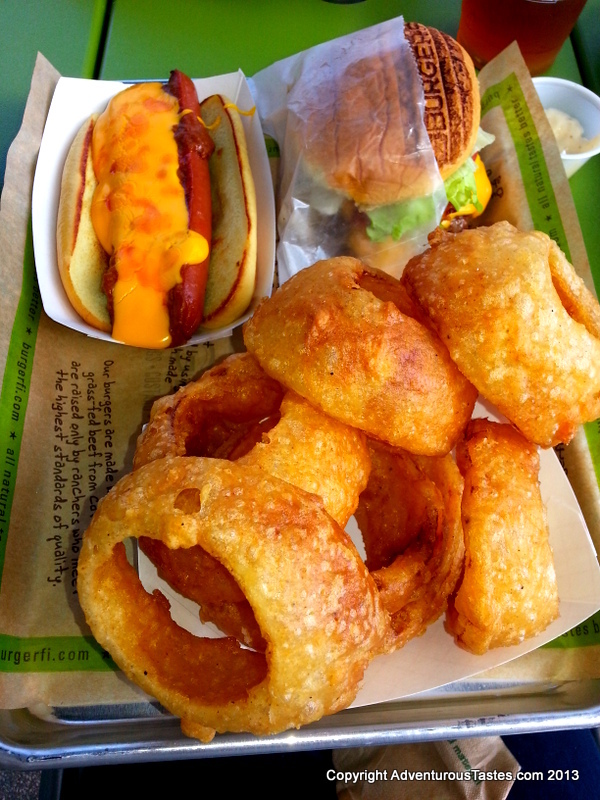 The photo of the onion rings is not an optical illusion, the large is really that ginormous. It would be more than enough for two people even with no other sides. You can get other toppings for your fries or onion rings like salt and vinegar or hot cajun spices, but we stuck with just the plain onion rings. We also tried a kobe hot dog served Texas Style with BurgerFi® chili, cheese sauce, and hot sauce. I didn't have a regular hot dog to compare it to, but I'm not sure I can discern a big taste difference between a really good regular hot dog and a kobe dog. But I am sucker for a good chili dog, and this one didn't skimp on the chili or cheese. I was running out of room by the time I got to the hot dog, but I would definitely go back to BurgerFi next time I have a chili dog craving. All of that is enough to make it a worthy addition to our burger scene, but the concretes are where this place really blew my mind. What's a concrete, you ask? According to Wikipedia, a concrete is "a specialty style of milkshake, the 'concrete,' was '...a milk shake so thick that the server hands it out the order window upside down, demonstrating that not a drop will drip.'" 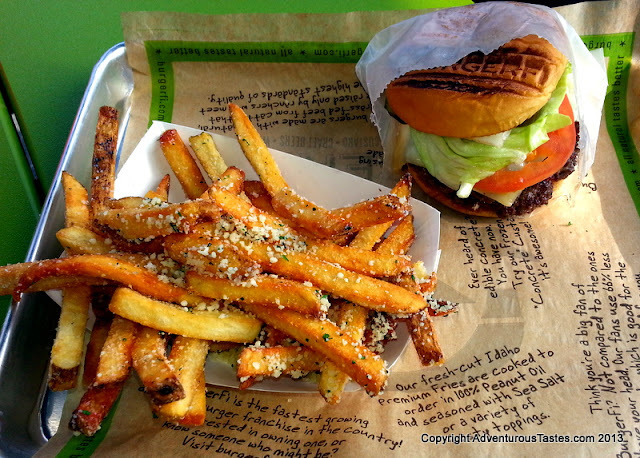 BurgerFi makes them with custard and all-natural ingredients, and they are crazy good. We sampled the Red Velvet Concrete (vanilla custard layered with red velvet cake), the Key Lime (vanilla custard layered with key lime pie) and the O.M.C. (chocolate custard, peanut butter, brownie, chocolate chips, and chocolate sprinkles). I loved that they had big chunks of their ingredients in them. All were delicious, but it was the O.M.C that blew my mind. Is there anything more sublime than chocolate and peanut butter together? It was good enough that we might have pretended that we hadn't sampled it yet so that we could sample it again! On the website, every dish includes its calorie count, and I would suggest turning a blind eye when it comes to the O.M.C's whopping 1440 calories because it's totally worth blowing your diet for. Or maybe you could just share it with a couple friends? I'm really liking the Emory Pointe development, which also includes the General Muir, La Tagliatella, a Loft store and free parking, and I love that BurgerFi has a friendly staff and a nice big patio for pretty spring days. We even brought little Gemma with us to sit on the patio, so I can definitely see adding BurgerFi to my list of family friendly options nearby. 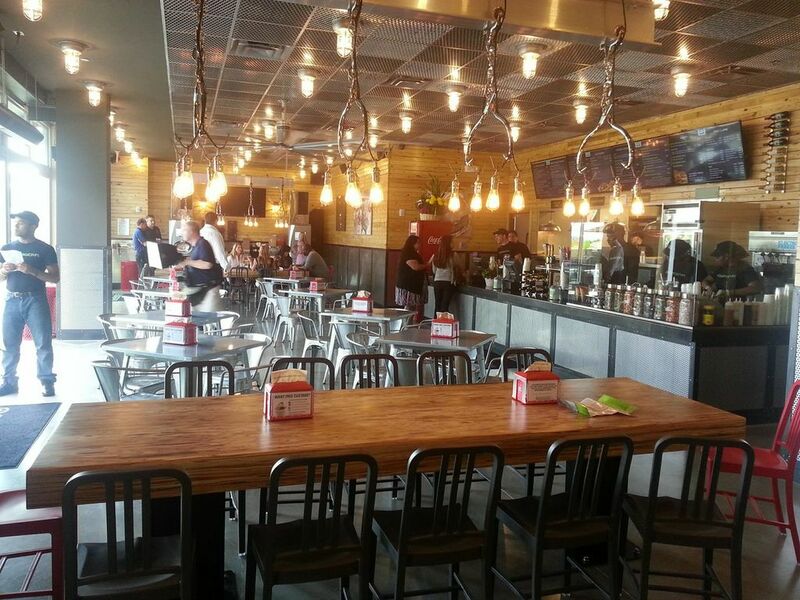 Locations in Alpharetta and Kennesaw are coming soon, too!